Join the fellowship and good will among members of OLG’s active parish-based service organization, International Catholic Families (ICF). The ICF continues to grow as its membership has doubled since it was established in 2012.
International Catholic Families engages in charitable services and community building through the preparation and sale of delicious international food throughout the year. The Italian Sausage and Meatball Sandwich Sales as well as Filipino Food Sundays (Chicken Adobo, Pancit, and Lumpia) are just some of ICF’s popular activities — even among non-members! The organization offers plenty of fun outings and bus trips such as Octoberfest at the Phoenix Club of Anaheim and the Vatican Art Exhibit tour. 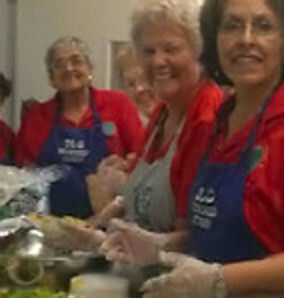 Our monthly ICF meetings include dinner prepared by alternating cooking teams comprised of club members. We welcome all ages. Our meetings are usually held on the first Wednesdays of the month begining at 6:00 pm in the Parish Center. Watch the bulletin for meeting notices and special events. We encourage your attendance and membership! For more information, call Carla at (619) 368-2585. Order freshly-made mild or hot sausage (bulk or links), meatballs, and sauce in advance. Pick up your order Sat, Nov 17, from noon to 2:00 pm, and Sun, Nov 18, from 8:00 am to 1:00 pm.